Although 99Bitcoins has been around for a while, it just occurred to me that we’ve never really covered the basics of Ethereum transactions even though we’ve discussed Ethereum itself. So this post is aimed at all of the Ethereum newbies out there: let’s understand how to read an Ethereum transaction. The first thing you’re going to need in order to read a transaction is an Ethereum block explorer. A block explorer is a search engine that allows you to search inside the Ethereum blockchain for transactions, addresses, and other interesting information. In this case, we’ll use EtherScan, one of the most popular Ethereum block explorers out there today. 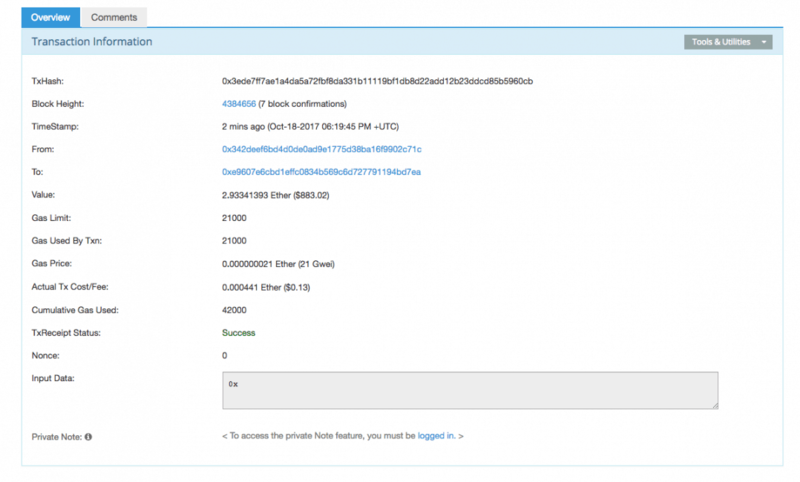 Let’s take a look at a random Ether transaction via EtherScan. TxHash – Also known as the transaction ID, TxHash is a way to look up a specific transaction on the Ethereum blockchain. Before we move to the rest of the terms, let’s look at a short explanation of “gas.” Gas in Ethereum is somewhat similar to transaction fees in Bitcoin. Each operation on the Ethereum network requires a fixed amount of gas (adding two numbers costs 3 gas, calculating a hash costs 30 gas, and sending a transaction costs 21,000 gas, for example). Gas is paid in Ether, but you can’t own gas. It’s just calculated at a fixed gas/ether exchange rate when you send a transaction on the Ethereum blockchain. We’ll talk more about gas in a different article. Gas Price – The price of gas in Ether. Gas’s price is decided by miners. (One GWei is 10^9 Wei or 10^-9 ether). Cumulative Gas Used – The total amount of gas used when the transaction was executed on the block. This doesn’t have any real meaning for us at this point. Tx Receipt Status – Was the transaction successful? Nonce – A sequential number tied to every transaction that represents the number of transactions the sender account has made on the network. So for example, the first transaction an account sends will have a nonce of 0, the second a nonce of 1, and so on. That’s it! You now know the basics of how to read an Ethereum transaction. I am not a techie. But Can I able to buy Ethereum like wise a share? If I can, then can I keep it say for example a year and can I able to sell after a year?, question is, is this crypto currencies be used as a method of investments? or I need to do any activities like wise ‘mining’ (though I need to understand about it) even if I buy some crypto currencies? How is the Gas Limit determined by the sender, is it just an assumption from the sender? And is it possible to have a Gas Limit that isn’t sufficient for transaction to take place and what happens to such a transaction?